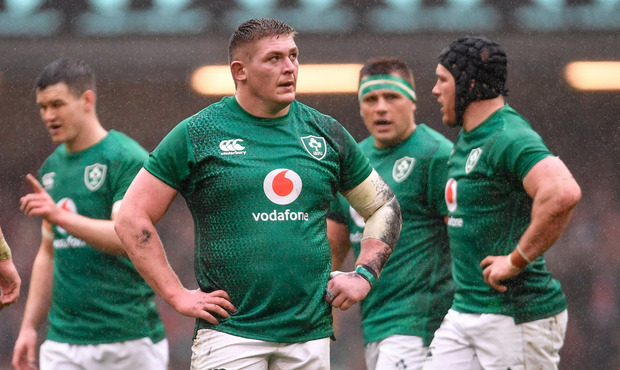 The roof was open, but the world caved in on Ireland as Joe Schmidt's side exited the Six Nations with one of the worst performances in recent memory. The decision to leave the stadium open to the elements back-fired badly, but there was so many concerning elements to this awful display to blame the wet ball. The coach and his captain Rory Best couldn't have asked for a worse way to bow out of the Six Nations stage. Jordan Larmour's 82nd minute try wiped the nil from the scoreboard, but there was no masking the humiliation as the celebrations continued regardless. They are no longer the world's No 2 team having ceded their place to the new Grand Slam champions who thoroughly deserve their crown after this utterly dominant performance. The hosts were ahead within 61 seconds of the kick-off and never looked back. After seeming to recover their form against France, Ireland's errors crept back in. Their handling was poor, their discipline worse and the pillars of their game – their set-piece – wobbled badly. They have a pre-season and four warm-up games between now and their opening World Cup game in Japan and they have plenty of work to do to turn a poor Six Nations campaign around. Like their opening day defeat to England when Jonny May got over within a minute and a half of kick-off, Ireland found themselves on the back-foot early. Jacob Stockdale took Gareth Anscombe's kick and was met by a gang of red jersey and unceremoniously bundled into touch. After a couple of post-lineout phases, the out-half delivered a delicious chip with the outside of his right foot for his fellow New Zealander Hadleigh Parkes to score after 61 seconds. Anscombe converted and Ireland looked to hit back quickly. Their first attack came to an abrupt end when Garry Ringrose threw a loose pass, but when Keith Earls had to scramble back to collect Anscombe's kick he was tripped by Josh Adams. Johnny Sexton reacted quickly and sent a cross-kick Stockdale's way. He gathered brilliantly and looked to be on his way until Parkes somehow got across and made the tackle, forcing Stockdale to spill the wet ball. It was one of a number of handling errors that brought Joe Schmidt's decision to keep the roof open to mind. Ireland were a little off generally, however, and they needed a brilliant Tadhg Beirne turnover to stem the Welsh momentum on their own line, but Anscombe extended his side's lead with a superb long-range penalty after Sexton went off his feet at the ruck. Their discipline was letting them down and they got away with one when CJ Stander strayed offside only for Gareth Davies to get the penalty overturned by diving on Bundee Aki. It was harsh, but it kept Ireland in the game and they worked their way up the pitch and turned down an opportunity for a kick at goal when Wales pulled their maul down. Instead, Sexton kicked to the corner but Adam Beard brilliantly drove through the maul and got hands on the ball. Rory Best tried to break free, but Justin Tipuric wouldn't let him and Angus Gardner awarded a Welsh scrum. Still, they kept the pressure on and forced a free-kick in the '22 but Stander knocked on as he tried to tap and go. Wales cleared their lines and another handling error and subsequent scrum collapse allowed Dan Biggar kick for position but Josh Navidi went off his feet just as they were building momentum and Ireland relieved the pressure. Yet Best's throw was poor and the lineout went astray and Furlong crept up offside to allow Anscombe the opportunity to make it 13-0. Error compounded error. Conor Murray kicked a standard box-kick out on the full and James Ryan knocked on as he lined up Navidi. Wales' scrum earned another penalty and Anscombe added another three points before the break. The second-half started as the first finished with Ireland ragged and Wales rampant. A stodgy scrum ruined a pre-planned move, Sexton kicked out on the full and then Cian Healy gave away a sloppy penalty for Anscombe to extend his team's lead once again. Sexton kicked the restart out on the full and, when Stander was penalised for not rolling away, Anscombe kicked the goal and Ireland were 22 points behind. A well-worked move off lineout finally got the visitors on the front-foot as Gareth Davies strayed offside. Murray kicked to touch and, while the lineout was sloppy, iot still came back on the Irish side but a promising move came to nothing when Sexton's passed it to nobody and the stadium erupted with glee. A mix-up in the Welsh lineout almost allowed Murray in, but he was stopped short. The ball came off a red sock and went into touch. Ireland's attack from the 5m lineout was insipid and Justin Tipuric forced a turnover. Earls had to be alive to scramble back and snuff out a Welsh kick through when Murray's pass went to ground and after consulting the big screen Gardner correctly awarded a scrum on the 5m line. Finally, the Irish scrum forced a penalty and Sexton cleared. The errors continued and after Stockdale spilled a high ball Andrew Porter went off his feet to hand Anscombe another kickable penalty. As the crowd began the Grand Slam party Ireland went in search of a score to at least wipe the big, fat zero fron the big screen and, after turning down a cople of shots, they couldn't manage to force their way over and when Ringrose knocked on the Principality erupted. They got over the line deep into injury time, but it didn't matter. Wales had made their point and Ireland watched them lifting the trophy before trooping off to consider how far they have fallen in a matter of two months. WALES – L Williams; G North (D Biggar 9), J Davies, H Parkes (O Watkins 71), J Adams; G Anscombe, G Davies (A Davies 57); R Evans (N Smith 52), K Owens (E Dee 61), T Francis (D Lewis 52); A Beard (J Ball 71), AW Jones; J Navidi, J Tupuric, R Moriarty (A Wainwright 71). IRELAND – R Kearney (J Larmour 65); K Earls, G Ringrose, B Aki, J Stockdale; J Sexton (J Carty 73), C Murray (K Marmion 71); C Healy (D Kilcoyne 59), R Best (capt) (N Scannell 65), T Furlong (A Porter 65); T Beirne (Q Roux 59), J Ryan; P O'Mahony, S O'Brien (J Conan 50), CJ Stander.